We are the leading manufacturer, trader and service-provider of Glass Partition System. Additionally, it is strictly tested by our quality controllers on various parameters in order to ensure its flawlessness. 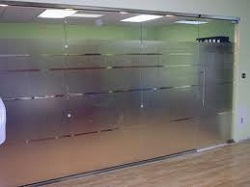 We are engaged in offering Glass Partition that is widely used in offices and commercial areas. 'Navdeep Engineering Pvt. Ltd.’ was incepted in 2008, We are manufacturer, trader & service-provider of Stainless Steel Furniture & Partitioning System. We are offering a wide range of Partitioning System, Customized Doors & Stainless Steel Furniture. We provide services of Installation, repairing and AMC Work. Our technical proficiency enables us to provide complete design engineering, prototype sampling, part production and timely delivery. We have an R&D department that analyzes the current market trend and develop innovative skills for the production of premium quality products. The capacity of the manufacturing facility ensures in quality product with accuracy & timely deliverance, providing sound insulation, Load bearing capacity, Chemical resistance for your esteemed facility. To help our industry, we are providing superior value in order to perform profitably and efficiently.